Angoras are affected during times of drought or grazing shortage. 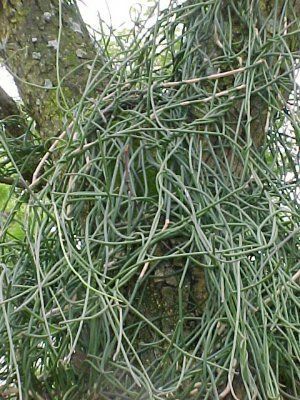 ‘Melktou’ is a leafless succulent, vigorous climber (can be shrub-like) which grows in and over trees and other shrubs, sometimes smothering the supporting plant. Without support it forms a bush about 1m high. The lower part of the stem has a thick corky bark. 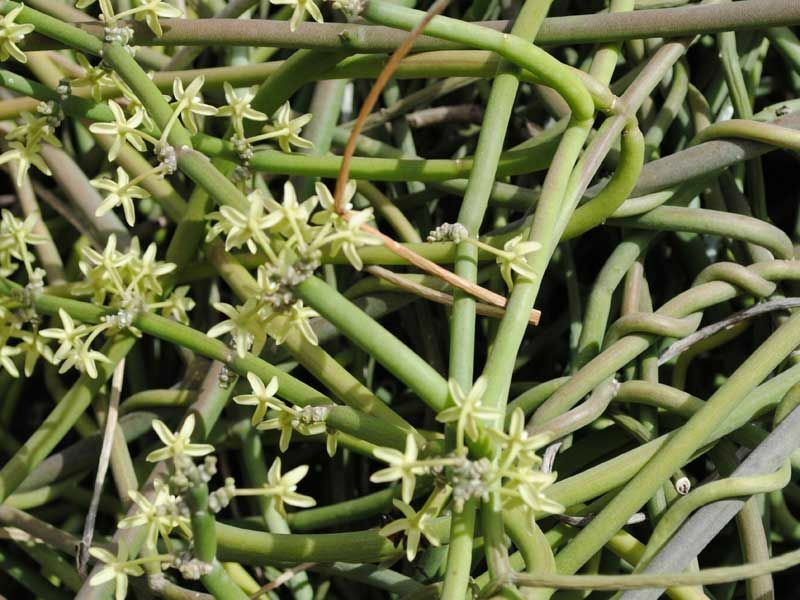 The grey-green branches are pencil-shaped, usually ± 5 - 10 mm in diameter. White latex appears when the plant is damaged. It has no leaves. Flowers are star-shaped, creamy-white to yellow and sweet smelling. In clusters at the nodes. The fruit resembles a pair of horns. The flat seeds have each a plume of stiff hairs. Angoras will only eat any significant amount under times of nutritional stress. About 10g/kg (300g) would most likely kill an Angora goat. Nervous syndrome. Clinical signs first appear after about 4 hours and death within a day. Spasms and head is pulled back or down, back is arched and legs extended. The clinical signs can be differentiated from ‘Krimpsiekte’ that tetanic seizures can occur which does not occur in ‘krimpsiekte’ which is primarily a paretic syndrome. Symtoms may at times may also be confused with Heartwater. Plant remnants in the rumen.